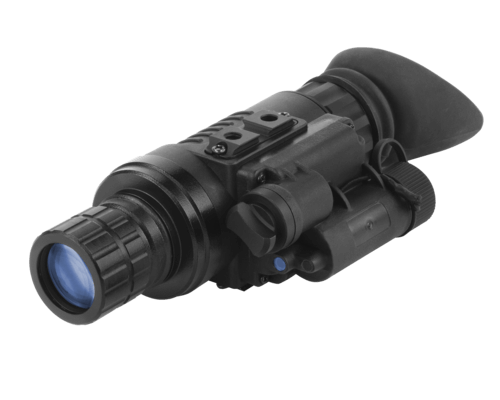 The ATN Night Spirit MP Multipurpose Night Vision Monocular is a high performance modular night vision device. The flexibility of the ATN Night Spirit MP makes it an ideal choice for elite military personnel conducting CQB style operations, tactical law enforcement teams operating in urban or MOUT environments or even security-conscious civilians. The ATN Night Spirit MP can be handheld, head-mounted, and can be attached to a helmet or weapon. Compatible with most IR laser aiming/illuminating devices, this model defines multi-mission versatility. This high performance unit enables walking, driving, weapon firing, short-range surveillance, map reading, vehicle maintenance and administering first aid during nighttime operations. The ATN Night Spirit MP Multipurpose Night Vision Monocular is also equipped with ATN’s Total Darkness Technology featuring a built-in infrared light-emitting source giving it maximum flexibility even when available ambient light is minimal. The technologically advanced ATN Night Spirit MP guarantees a tactical advantage for any user operating at night, whether military, law enforcement, or civilian.